Shell made of strong phenolic compound with deep, wide skirt to prevent flash-over and makes it easier to join larger wires. 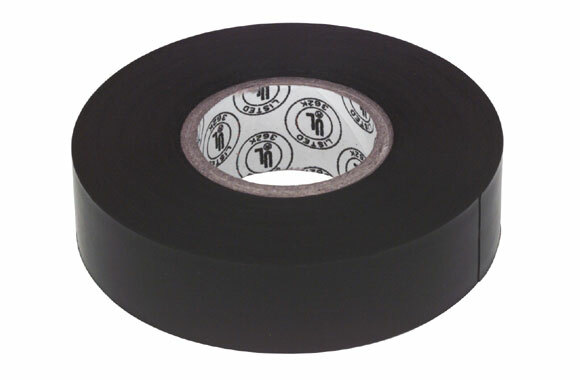 The strongest, shakeproof, pull-proof wire joint you can possibly find. Item: Fixed spring wire nuts. These cable ties lock in a snap and are almost impossible to unlock. 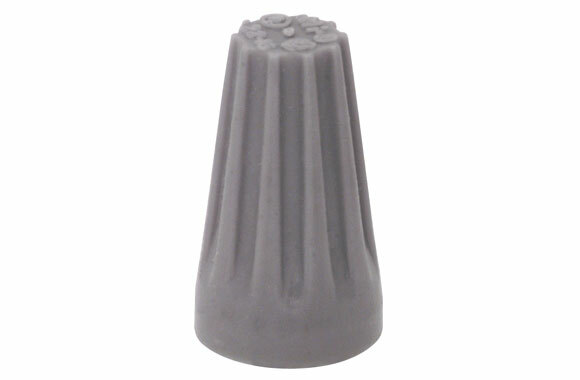 They are made of strong, durable 6/6 nylon - fungus inert and chlorine free. Normal temperature range is -40°F to 185°F. Components are U.L. recognized. 1000 ties per bag. 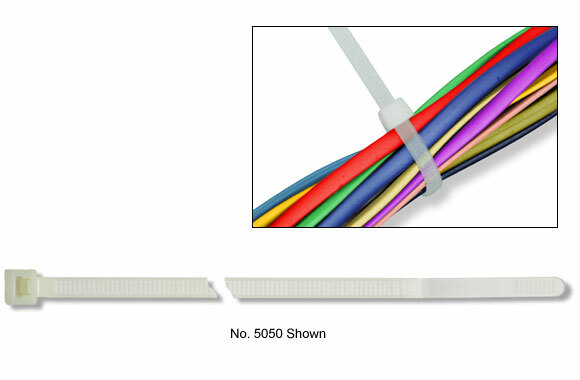 Item: 4" (100mm) Natural cable ties (1M). Width: .089". Min. Tensil Strength: 18 lbs. Size: 4" x .089". Tensile Strength: 18 lbs.. Item: 5-1/2" (144mm) Natural cable ties (1M). Width: .14". Min. Tensil Strength: 40 lbs. Size: 5.5" x .14". Tensile Strength: 40 lbs.. Item: 8" (188mm) Natural cable ties (1M). Width: .19". Min. Tensil Strength: 40 lbs. Size: 8" x .19". Tensile Strength: 40 lbs.. Item: 11.1" (278mm) Natural cable ties (1M). Width: .19". Min. Tensil Strength: 50 lbs. Size: 11.1" x .19". 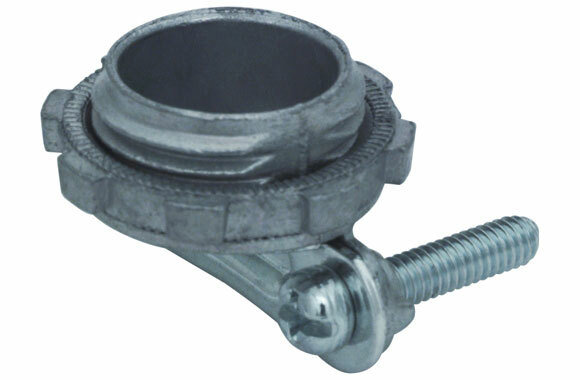 Item: 1/2" KO connector. For: Switch Boxes. This switch has a long lever actuator designed to withstand excessive impact, bending and over-travel for such applications as counting bulky material where precision actuation is not a critical factor. Operating force is 1 ounce maximum. 15A, 125/250/420VAC. 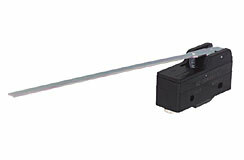 The rigid lever actuator has a hard plastic roller, which particularly suits this switch for fast operation where operating force may be very low. Effect of vibration upon the actuator is reduced by a return spring. Operating force is 3-1/2 ounces maximum. 15A, 125/250/420/480VAC, 5VDC. 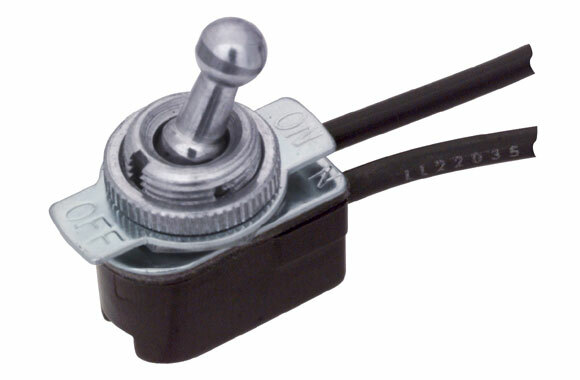 This switch can be used as a manual/mechanical push button or for in-line operation where considerable over-travel is desired. 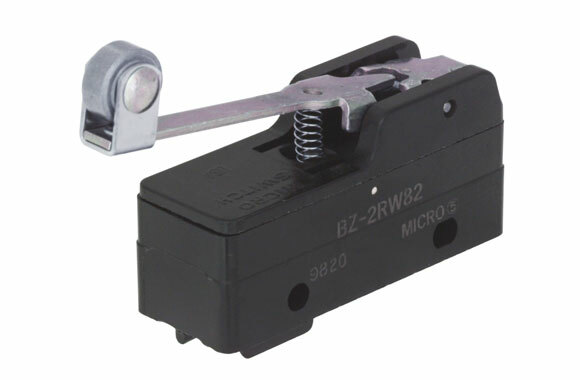 Panel mounting permits adjustment of operating point with respect to the actuating device. Operating force is 9 to 13 ounces. Push buttton diameter 5/16". Enclosed mercury switch consist of an embedded single pole, single throw mercury switch surrounded by a protective enclosure. 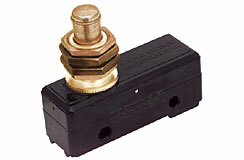 This switch is unaffected by water or vapor and is resistant to oil, alkalies and acids. Has 6" plastic insulated leads and a different angle of 12° maximum. Fast tilting action is recommended. Enclosed mercury switches are rated for a resistant load of 3 amps, 115 volts AC or DC; 2 amps, 230 volts AC; 1.5 amps, 230 volts DC. Motor load is 1.8 amps, 115 volts AC; 9 amps, 230 volts AC; 65 amps, 115 volts DC; .35 amps, 230 volts DC. 1/2" diameter, 1-7/8" long. 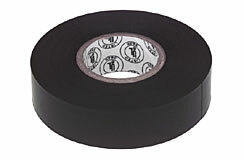 Rated at 6 amps, 125 volts; 3 amps, 250 volts. Single pole, single throw with 6" #18 wire, on/off plate and mounting nuts. 15/32" thread mounting sleeve, 9/32" long. Trim, small, lightweight, instantaneous! Accurate control in modern treadle switches. Single pole, double throw, momentary contact interior that can be wired open or closed. Rubber non-skid treadle and base pad. 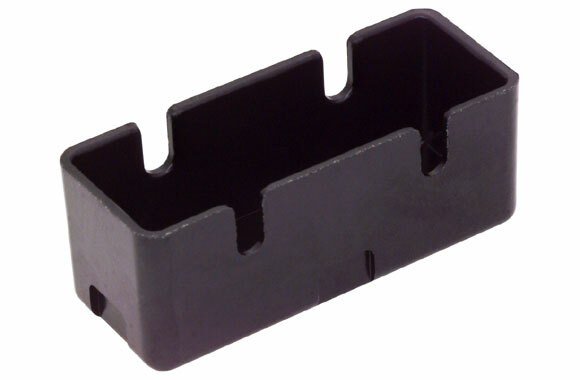 Formed steel casing with black finish. 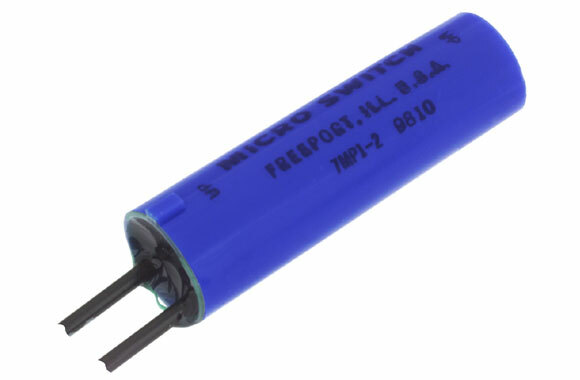 Rated at 7 amps, 125/250VAC. Weighs 7 ounces. 3-1/2" long, 2-5/8" wide and 13/16" high. 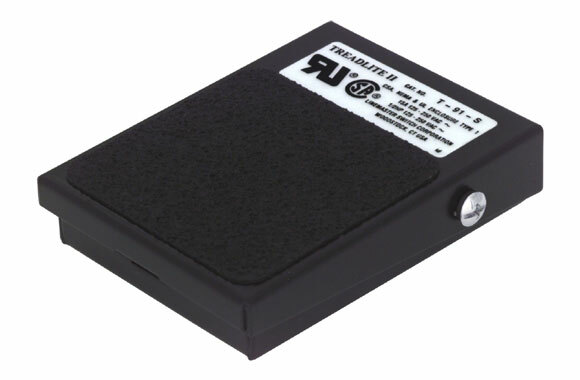 Item: Linemaster electric treadlite foot switch. Pole: Single. Amps: 7. Throw: Double. Contact: Momentary. Throw: double. Contact: momentary.